PSPG is an excellent tool for database administrators. The program is a pager optimized for terminal database clients like psql, mysql or pgcli. It allow to freeze scrolling columns headers and first n columns (like row headers). The tool implements many of the same shortcut commands found in “less” pager or “vim” editor for navigation and searching. This pager is distributed with 21 color themes (3 are hi colors). It is build over ncurses and st-menu libraries. Download the latest copy here. 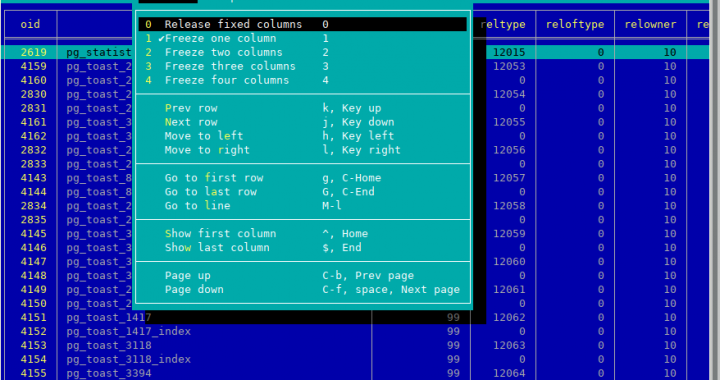 New Software Listing – Chess for the terminal! CBoard is a Console/Curses PGN file browser, editor and interface to chess engines supporting the XBoard protocol. It supports SAN move format with annotations including RAV, NAG, single and multi-line comments along with the FEN tag which can be edited by arranging pieces on the board. It can also validate and save to (optionally reduced) PGN format. Multiple games (human/human, human/engine, engine/engine) can be loaded, created, searched and edited. You can also customize the key bindings and create macros. Version 2.1.8 fixes an important issue with color mappings on terminal types that support 256 colors. Until recently, not many terminals supported this. After I upgraded to Bionic Beaver (xubuntu 18.04 LTS) I was quickly finding that most terminals were. This was causing VWM to render a black screen on 75% of the terminals I tested with. It’s been a long time coming, but I’ve just released version 3.1.1 of VWM. There’s an important bugfix if for those using the mouse. There’s also a new version of libviper that was released which will make VWM run correctly on terminals supporting 256 colors. Without this library update, you’ll see a completely black screen on many terminals. Vlock 2.2.4 released! 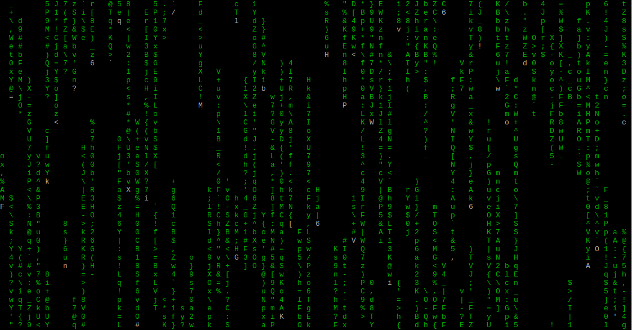 Adds a Matrix like screensaver. Version 2.2.4 of the Console Craze fork of vlock has been released. This version includes a port of the awesome cmatrix novelty as a screensaver. The version is somewhat stripped down to run under VWM. Additional functionality from cmatrix will be added in the future. Vlock has forked! New features! Because vlock is such a wonderful compliment to VWM the tool has been forked by Console Craze. A new screensaver has been added as well. 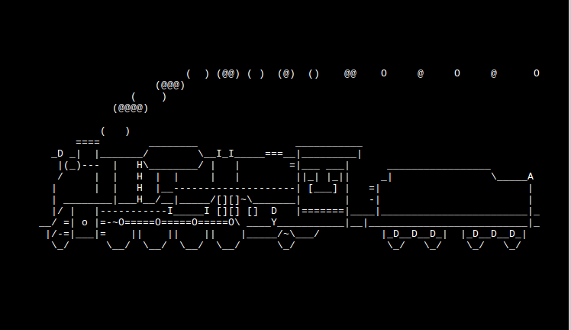 The all too familiar SL train can be invoked as a screensaver. Viper Window Manager 3.0.2 Released! What is VWM? Viper Window Manger (VWM) is a lightweight window manager for the console. You heard right! VWM is a window manager for the console. It’s built on top of libviper which is a convenience layer on top of ncurses and a GTK-like framework for rapidly creating console programs. Building the stack was difficult because it all relied on handwritten Makefiles. It needed a better build system. Glib was scattered throughout the code because of some of its convenience features. It needed to be removed, but doing so would mean writing equivalents using libc and POSIX standards. The libviper framework was not only dependent on Glib, but it also relied on the FORM and MENU libraries which are unique to ncurses. It would never be possible to port VWM to other curses implementations (such as pdcurses). Much of the code in libviper ended up being redundant. The code-base was heavily bent toward an object-oriented language, but it was written in C. Rewriting the code in OOP C provide long-term benefits but lots of effort. Both libviper and VWM never used multi-threading, but primitives were in place just in-case. It simply didn’t make sense. On top of that, VWM was using a crude task queue system. It worked, but it lacked the granularity and elegance that protothreads or co-routines offered. A protothread implementation made sense, but once again, it was a big undertaking. The integrated terminal was using libvterm (formerly libRote) but compatibility was poor. Most of what you want to do in a console window manager requires a good terminal emulator. The emulator need a lot more work if it was going to be even modestly useful. All code uses the CMake build system. This includes libvterm, libviper, libprotothread, and vwm. There is no more dependency on the FORM or MENU libraries. Equivalent functionality is provided by native code. There are still obstacles for porting to pdcurses but the barrier is much lower. The libviper framework has been written in OOP C with GTK-like interfaces. All of the threading primitives have been removed and multitasking is implemented with Larry Ruane’s protothread library. Although VWM does not support multiple desktops, much of the underpinnings have been implemented. VWM now uses libconfig to read configuration files. The libvterm emulator has received lots of enhancements and is compatible with 99% of the programs cataloged here on Console Craze. The VWM configuration file enables users to add programs to the menu in several different modes including fullscreen. There’s definitely more to do and I’d be happy to have the help. If you want to get invovled, let me know and I’ll be glad to add you to the official repositories.